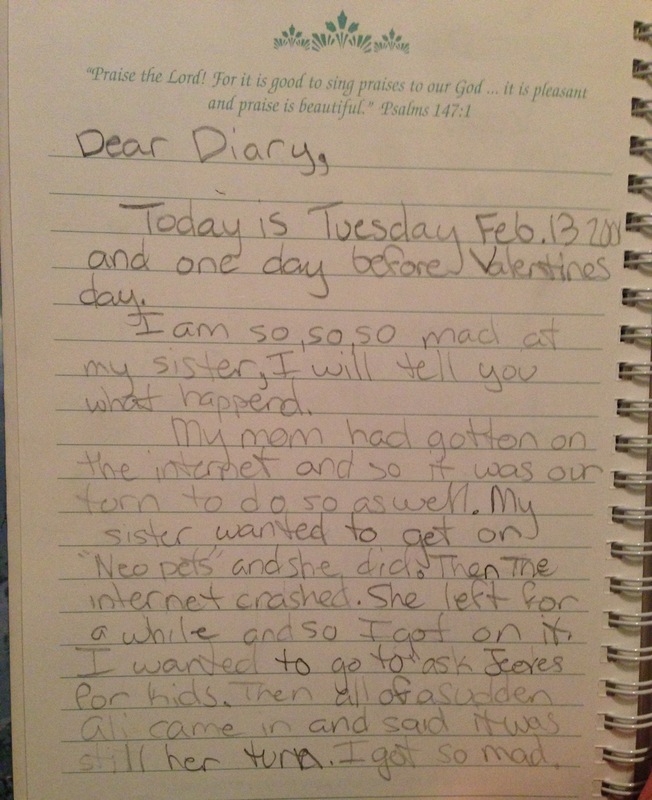 Below is an entry I made in my diary exactly twelve years ago today. I was eleven years old. The first thing that I realized upon reading this (other than my poor spelling and grammar) was that this was written during the early days of the internet when it would crash for no apparent reason during the worst moments possible – namely in the middle of a very gripping Neopets game of Dice-A-Roo. It was also the point of my life when we only had one family computer. It lived in the hallway at the top of the stairs and its usage was on a very strict time schedule (we had to be fair, you know). This was a time before Google, when you had to ask a presumptuous butler to answer your random questions. A time when you had the dial-up tone memorized and your mailbox would greet you with “you’ve got mail.” A time when chatrooms were totally da bomb, you had to upgrade your AOL with a computer disk that came in the mail, and when not getting to be on the computer would ruin my day. And make me so, so, so mad. It was a simpler time. It’s always weird for me to read my old journals. I think it’s because, although I can’t really remember what the weather was like or what clothes I was wearing, I can always remember how I felt at the moment I wrote an entry. Like some weird sixth sense connection I have with my past self. I sometimes forget that little girl didn’t disappear. She’s been with me all along. She’s a little taller and a little bolder, but she’s still the same little girl who was afraid to grow up. The girl who loved climbing trees and making mud pies. The one who wanted so much to be appreciated for being herself. To have her schoolwork posted on the refrigerator and to be called upon by name. The little girl who, when everyone wanted to be models or mothers or princesses, had wanted to be a writer.